SOUTH BEND, Ind. (AP) — Ian Book threw a 35-yard touchdown pass to Miles Boykin with 5:43 remaining and No. 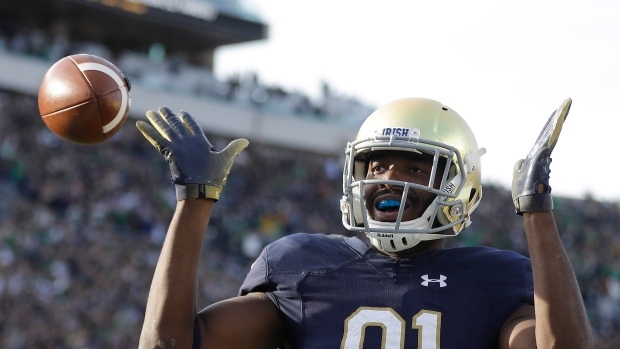 5 Notre Dame remained unbeaten, holding off Pittsburgh 19-14 on Saturday. An official held back Florida coach Dahn Mullen as he yelled at Vanderbilt coach Derek Mason, who was near the Gators' sideline after checking on the Commodores defender whose helmet was knocked off by a hit by linebacker James Houston IV. Both teams spilled onto the field, drawing unsportsmanlike conduct penalties. The penalty cost the Gators their leading tackler, with Vosean Joseph ejected for his second such penalty of the first half. Two people escorted an emotional Joseph off the field.